Although Blackburn has been a site of Christian worship since the 5th century it is home to one of England�s newest and smallest Cathedrals. This remarkable building is a mixture of Victorian and late 20th century architecture, and possesses an impressive array of modern religious art, including work by John Hayward and Josefina Vasconcellos. A church was recorded in Blackburn, possibly on the same site as the Cathedral, as early as 596AD. The parish church of St Mary the Virgin was erected in Norman times and enlarged throughout the mediaeval period, but the expansion of Blackburn in the 19th century resulted in a completely new church being erected on the site in 1820-26, designed by John Palmer. 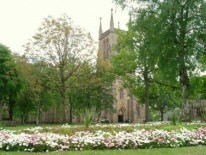 In 1926 the Diocese of Blackburn was formed, with the church becoming elevated to Cathedral status. Plans were made to enlarge the building for its new role. The work began in 1938, but was not completed until the 1960s. In 2016 work was completed on a Cathedral Close including accommodation for clergy and lay staff,new office buildings and conference facilities. The buildings surround an attractive garden with a fountain. A new café run by the Michelin starred Northcote organisation is also part of the new development.